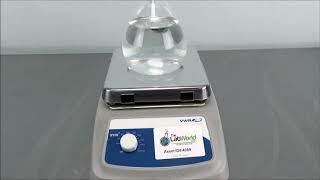 The VWR Standard Magnetic Stirrer with an aluminum top is simple to control, and requires minimal space. This lab mixer is compact and microprocessor controlled with a slow ramp feature to minimize splashing while, while improved magnetic coupling maintains excellent speed control. This magnetic mixer is outfitted with an aluminum top that won’t chip or crack if dropped, with components housed in a chemically resistant, spill resistant body that channels away spills for years of dependable use. The low-profile design of this laboratory shaker means it can be placed just about anywhere, such as a fume hood or by a workstation. This VWR Standard Magnetic Stirrer has been fully inspected and is performing to expectations. All of our lab equipment comes backed with our standard warranty. Should you have any questions, please don't hesitate to contact us.